If you prefer to try latex paint, pick an acrylic latex. This is usually your cabinet and trim paint, so if you’re not sure ask your local paint retailer for their preferred paint for cabinets. This paint is more durable than wall paint. I prefer Sherwin Williams Proclassic, but it is pricey (even with 40% off). If you’re going to use some type of latex paint, you will need to sand and prime the piece first. I would recommend that if you don’t have a paint sprayer, you buy some spray cans of primer. This makes the priming go so much faster, and it gets a more even coat than brushing on primer. The paints usually have some self-leveling capabilities, so I think they dry smoother than the primer when brushed on. When I paint with a brush, most of my brush strokes are a result of the primer, not the actual paint. 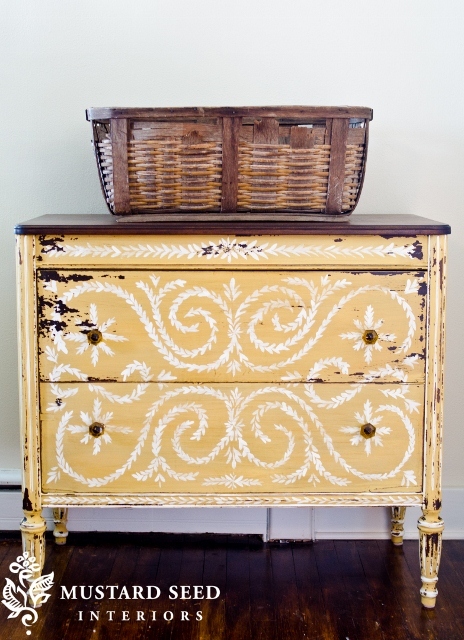 However, brush strokes are often sought after in old vintage furniture, so this makes your job easier. If you see I mentioned above that you also need to sand the piece before priming. Sanding does not mean you have to remove all of the old finish, even if it’s paint. You just need to rough up the surface enough for the primer to adhere. I use a rotary sander and quickly run it over all the surfaces with a fine grit sandpaper (220) attached. Don’t let sanding stop you from painting a piece of furniture. It is an easy step. After your paint has dried, I’d say at least two coats of paint would be preferred, you can do some sanding to distress your piece. I usually take my rotary sander and lightly go over the edges of the furniture. You can also use a coarse piece of sand paper and go over the edges. You can distress as much or as little as you prefer. I tend to go middle of the road, not too heavy, but not too light either. I love distressing furniture (when it fits with the piece). It is so much fun to see the changes it brings and the depth it adds to the look of the furniture. If I distress a piece of furniture, I also glaze it with a brown glaze. The glaze collects in the corners and the nooks and cranny’s of the piece and gives it that really old, worn look. I use Sherwin Williams Faux Impressions glaze. It is a clear glaze, so I can mix it with whatever color I choose. I usually mix it with a sample quart of chocolate brown paint from Sherwin Williams, but I have also mixed it with some dark stain. Below is a furniture set that I painted, distressed, and glazed with a chocolate brown glaze mix. If you’d like to skip the priming and sanding all together, you can use a chalk paint (like Annie Sloan’s). I have never personally used chalk paint, but I hear it is fabulous. Chalk paint can be brushed over a piece of furniture without taking the time to sand or prime the piece. You would distress the edges the same as with latex paint, and then instead of using a glaze to get the worn look, you would use a brown wax. The paint has a chalky finish, so to protect the piece you would finish by waxing with clear wax. There are many tutorials on the web explaining how to paint with Annie Sloan Chalk paint. Milk paint is another good option. Miss Mustard Seed has her own line of milk paint. I don’t know much about painting with milk paint, but there is a lot of information online for this method also. Milk paint gives you the chippy look, if you want a very distressed piece of furniture. 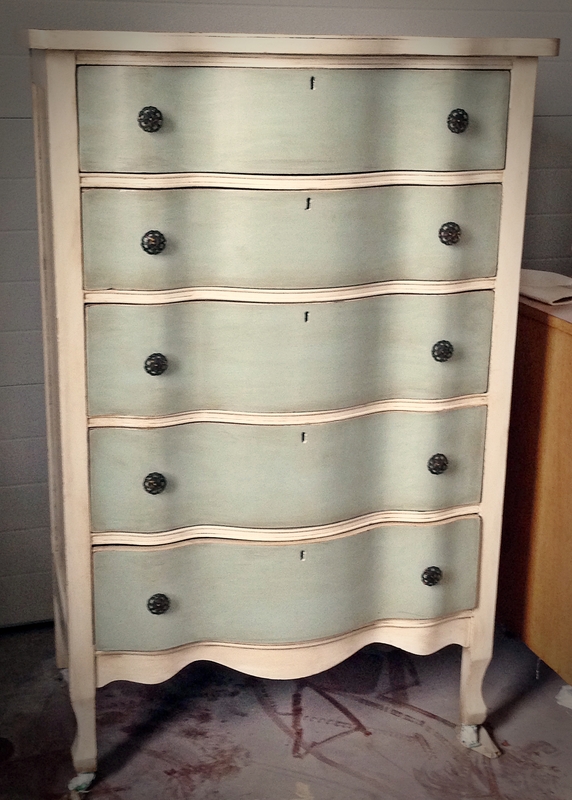 Below is a dresser painted by Miss Mustard Seed with her line of milk paint. You can see that it really achieves the chipped paint finish look (large chunks of paint are missing from the body of the dresser, not just on the edges). Click this link to open Miss Mustard Seed’s milk paint line. If you’d like to get some inspiration, on my Pinterest site I have a Painted Dresser, Painted Hutch, Painted Storage Furniture, Painted Table and chairs, Painted Beds, Painted Desk, and Painted Decor Boards. I also have a Furniture Tutorial Pinterest Board with lots of tutorials to help you along your way.